My new monoflap fits Freedom as well as Zelda. It just needs one extra pad. But after fitting Zelda with the Schleese, my fitter suggested we try it on Freedom. It’s a bit wide, but with an extra pad, it fits remarkably well. I’m thrilled because it’s a really comfortable saddle. So at least for the immediate future I have one of those unicorn saddles — the kind that fits every horse I put it on. Let’s talk saddles again. I am so curious about the Schleese. I am reading the book he wrote (have been for several months–something about ebooks I forget what I’m reading unlike a tangible book on my nightstand or in my purse). And I just had my County rep out to add more flocking. It is beyond amazing what a little wool can do to make a saddle feel better. It was too low on Knight’s withers and I felt like I just couldn’t get into the right spot. She added the wool, I got on and trotted around. My leg was stronger, I felt more secure in the saddle. I thought, “I know how to ride after all!” So much easier to ride correctly with a correct fitting saddle for him. Like the Princess and the Pea. If the saddle isn’t balanced on the horse it can absolutely make you feel unbalanced, too! 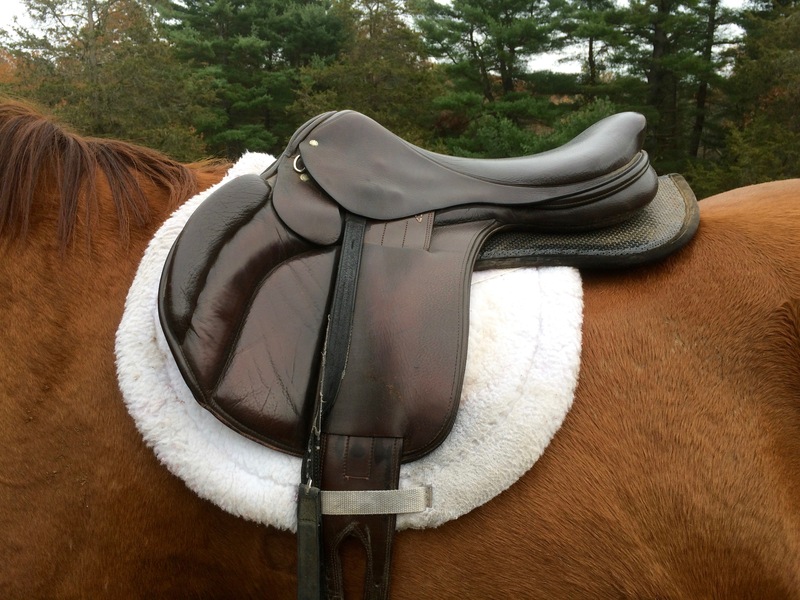 A saddle that is a bit low in front will tip you forward and leave you fighting with your tack. That’s why I prefer to buy a saddle with wool panels, rather than foam. I’m sure the new foam is pretty adaptable, but there are times when there isn’t enough “give” in the fit and the only way to make those saddles work is to put new panels on them. With wool flocked saddles and a good fitter, you have more options. Schleese has some great videos on YouTube that explain saddle fit for both horse and rider. I would never be able to buy a new Schleese saddle, but I got a very good deal on this one (it’s probably 10-12 years old). I actually owned a similar saddle many years ago but it didn’t work for the horse that I had at the time and left me feeling unbalanced over fences. So I guess you need a horse with the right shaped back, too. Thanks for sharing your post! I also have found the Schleese videos to be very enlightening. I am lucky, though, and have an excellent saddle fitter who visits me twice a year. My experience has been that when it regular/consistent work, my horses’ backs have stayed pretty consistent. Occasionally their saddles needed to be tweaked as the flocking compressed. However, as Freedom has gotten older (he’s 18 now) and Zelda got fitter, both of them changed enough to make their existing saddles not fit. Some if can be changed by reflocking, but it depends on the depth of the panel how much wool you can add. I also own a saddle with an interchangeable gullet system. It’s the Wintec Pro Jump (the poor cousin of the Bates) and it’s very useful for accommodating those changes. However, the flap isn’t really forward enough for my leg so I use it more as a back up or rainy day saddle.